In a bid to reach out for the future and unlock its secret promise, Al Hamad Construction Company, one of the largest contracting companies in the region, has purchased parcel 4.a of the Al Areen development grounds. The new acquisition represents a resort hotel – Domina Hotel Al Areen - engulfing the Lost Paradise of Dilmun water park situated at the northern edge of the development site. Announcing the news Mr. Nashath Sahawneh, Chairman of Al Hamad Group, “Bahrain is one of the most attractive tourist and commercial destinations in the Middle East. We are here to stay and play a key role in the Kingdom’s determination in achieving the status of the top most tourist and business hub of the region”. “Our key strength lies in our urge to seek innovative technologies in construction, continues Mr. Sahawneh “Al Hamad houses all the key components of the construction industry including design & development, and all relevant building materials and services within the group”. He also said “we are very excited to work in partnership with Al Areen and Domina group, we expect this to be first of several projects we will work with this partnership”. Mr. Khalid Mukatash, Bahrain Area Manager of Al Hamad Construction and Development said “This insightful move by Al Hamad was motivated by the hugely attractive possibilities offered by the colossal Al Areen development project, and the confidence it inspired in both investors and consumers alike”. Al Areen, which is a large-scale, luxurious urban, mixed use health and tourism spread, spans an area of 2 million square meters and is located on an elevated desert plot in the southern region of Bahrain. Mr. Mukatash adds “The parcel purchased by Al Hamad, spreading over 127,568 meters, does not only overlook the magnificent water park, but also has splendid views of the Al Areen Wildlife sanctuary west of the development site. Parcel 4, in addition to the superb view and the matchless natural surroundings, will provide comprehensive facilities that would include Domina Hotel Al Areen, which represents a perfect blend of the traditional Bahraini architecture and state of the art amenities. The hotel is schedule to open in June 2007”. The hotel will be managed by the Domina hotel group based in Milan, Italy. Domina hotel and resorts is a world renowned brand with over 24 hotels in 10 countries. Domina Hotel Al Areen marks the entry of the brand into Bahrain and its continued expansion in the Middle East. 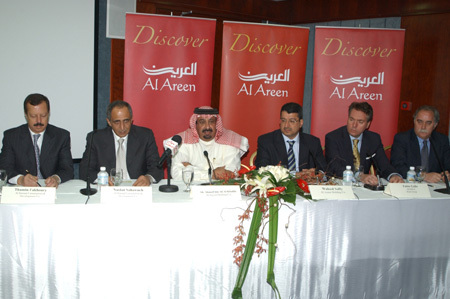 “Al Areen is very pleased with the new development, Al Hamad Construction and Development is the main contractor of the Bahrain Financial Harbor and the company responsible for the much anticipated Banyan Tree Desert Sp and Resort, has the expertise as well as the technical and human resources that enable it to participate effectively in such a diverse and challenging project. Well-known for its world-class construction practices, its high quality standards and services, Al Hamad is a welcome contributor to the Al Areen development project spread, which will be a testimony to the rising confidence in local markets” said Eng. Waleed Saffy, General Manager of Al Areen Holding Company. Eng. Saffy added “Domina Hotel Al Areen is the latest addition in a chain of landmark leisure projects, hosted within Al Areen development grounds which also includes Al Areen resort & Spa and the Al Areen Water Park”. Domina Hotel Al Areen, valued at US $ 150 million, will feature 346 spacious rooms including two presidential suits and 4 junior suits, 24 luxuries duplex villas, several restaurants and lounges, and a full integrated and comprehensive sports facilities and 35000 square foot convention center. The hotel is directly linked to the aqua park, where the guests can walk down and enjoy the facility. True to its name Al Areen, meaning "den" in Arabic, the project offers a sanctuary away from the hustle and bustle of urban congestion, and provides instead a haven of peace and tranquility in a natural and healthy environment, but without in the least compromising the standards of modern comfort and luxurious living. The commitment of both Al Areen and Al Hamad to proper environmental measures and procedures guarantee that the project will be the pride of Bahrain and the region.